So, some exciting news. Two other teachers and I are going to start a knitting club for the students at school. It'd be nice to have someone else around my age that also knits who I could learn from. I haven't touched anything in a long while and actually still have a half-finished glove that I started working on last Christmas still laying around. 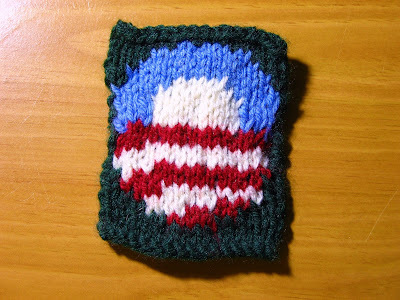 Well, with the election coming up and looking at fun stuff to do, I found a pattern for an Obama beanie. I actually had all the colors already (actually the blue is a little light and the red a little dark, but it looks OK) and wanted to try it out before going through making the whole beanie. Here's what I was able to do. It's my second attempt. On my first attempt, I didn't leave enough slack behind for each of the colors and after finishing, it didn't lay flat. This one doesn't look too bad. I've never used different colors with knitting and it's not all that easy. Anyways, yay me for being able to follow a pattern! What do you think?? I'll take one! I'm putting my order in officially. I assume they are very pricey? Can't wait to learn some knitting from ya!